Synthetic peptide within Human Myosin Light Chain 2 aa 150-250. The exact sequence is proprietary. Our Abpromise guarantee covers the use of ab92721 in the following tested applications. WB 1/1000 - 1/5000. Predicted molecular weight: 19 kDa. 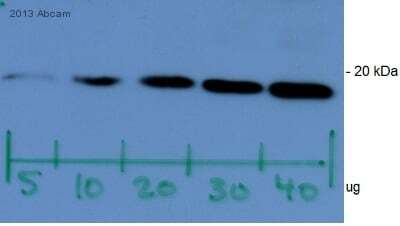 The use of an HRP/AP polymerized secondary antibody is recommended. Defects in MYL2 are the cause of cardiomyopathy familial hypertrophic type 10 (CMH10) [MIM:608758]. Familial hypertrophic cardiomyopathy is a hereditary heart disorder characterized by ventricular hypertrophy, which is usually asymmetric and often involves the interventricular septum. The symptoms include dyspnea, syncope, collapse, palpitations, and chest pain. They can be readily provoked by exercise. The disorder has inter- and intrafamilial variability ranging from benign to malignant forms with high risk of cardiac failure and sudden cardiac death. Defects in MYL2 are the cause of cardiomyopathy familial hypertrophic with mid-left ventricular chamber type 2 (MVC2) [MIM:608758]. MVC2 is a very rare variant of familial hypertrophic cardiomyopathy, characterized by mid-left ventricular chamber thickening. Myosin light chain-2 (MYL2, also called MLC-2) is an ~19kDa sarcomeric protein that belongs to the EF-hand calcium binding protein superfamily and exists as three major isoforms encoded by three distinct genes in mammalian striated muscle (PMID: 26074085). Although some cell lines are reported to be MYL2 positive, such as HeLa, 293T and MCF7 (PMID: 21487036, 21487036, 23093227), ab92721 only works in muscle and heart tissues according to our internal testing. ab92721, at a 1/100 dilution, staining Myosin Light Chain 2 in paraffin embedded Human heart muscle by Immunohistochemistry. ab92721 showing positive staining in Heart muscle tissue. ab92721 showing positive staining in Skeletal muscle tissue. ab92721 showing negative staining in Normal tonsil tissue. ab92721 showing negative staining in Normal brain tissue. ab92721 showing negative staining in Normal liver tissue. ab92721 showing negative staining in Normal kidney tissue. ab92721 showing negative staining in Normal breast tissue. Publishing research using ab92721? Please let us know so that we can cite the reference in this datasheet. I need to order antibodies for MYL7 ((ab92721) and MYL2 (ab137063). While going through the datasheets, I've seen IHC images of these antibodies but no reference is given for them. Can you provide us with the references for those images. Also, as we are regular customers of your products, can you provide us a small gift sample of these antibodies as our project is in infancy at present. I look forward for your early response. We only have full size vials of our antibodies, so we don't have samples to send out. However, we do have a promotion on rabbit monoclonal antibodies that is valid until December 16. For this promotion, if you purchase any primary antibody you can receive a free rabbit monoclonal. Since both of these antibodies are rabbit monoclonals (also called RabMabs), you could purchase one and then receive the other for free. If you'd like to take advantage of this offer, please include the code RABMAB-XBSMG with your order. I hope that this information will be useful, but please let me know if you have further questions or need anything else and I'll be happy to help. Thank you very much for helping me solving this problem. The antibody for troponin T that I worked before was ab8295, probably works better with my type of samples. I need antibodies that prove cardiac differentiation, that is why I bought cardiac troponin T and MLC2v. If you have suggestions please let me know, so we can make an agreement concerning the replacement of antibodies. Are you interested in an antibody against a different cardiac marker such as GATA4? The antibody ab86371 looks good. Click here (or use the following: https://www.abcam.com/index.html?datasheet=86371). The antibody ab8295, which you used before successfully, is a cardiac troponin T antibody. Do you want another vial of that, to replace the other troponin T antibody, ab33589? If not, then I suggest ab89594. Click here (or use the following: https://www.abcam.com/index.html?datasheet=89594). I bought 2 antobodies from your company and I am not able to get signal when I perform western-blotting under the conditions advised by you. I tried to increase also the concentration of antibody and I was unable to have a result. I am sure that is not a problem with the secondary antibody because the secondary antibodies worked with other primary antibodies. Both antibodies that I bought from you were shiped together, I don't know if there was some problem with it. The antibodies are ab33589 and ab92721. Is is possible to send me other antibodies to replace this ones? Thank you for bringing this to our attention. If I cannot offer a useful suggestion to improve your results, and if the antibodies are covered by our guarantee, I will send replacements. I will first need a few details of your experiment and your order. 1. Can you please tell me when you ordered the antibodies? If you have a purchase order number or the name of the person who placed the order, that will help me find it in our records. 2. Please describe your samples: what is the species and cell type or tissue, and how were the lysates prepared? Did you use protease inhibitors? 3. How much protein did you load per lane of the gel? 4. 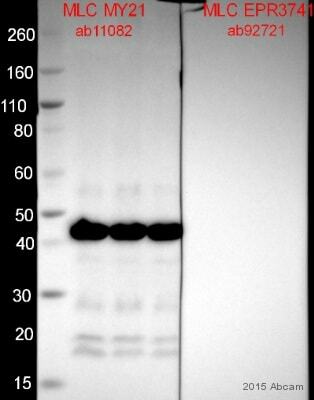 Are you confident that the transfer from gel to blot was successful? 5. What is the blocking solution? (For example, 5% milk in TBS or 1% BSA, etc.). 6. You mentioned using the antibodies as advised on the datasheets. What dilutions did you try for each antibody? 7. Are confident the secondary antibody is effective? 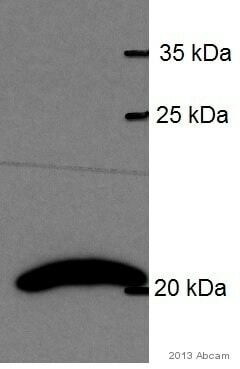 I have used ab48003 to stain primary mouse cell cultures of cell types I expect to be positive and cell types I expect to be negative for for myosin light chain 2. However all samples stain equally well with this antibody, leading me to think it is reacting non specifically. I have issued a free of charge replacement for one vial of ab92721. To check the status of the order please contact our Customer Service team and reference this number. Please note that this free of charge replacement vial is also covered by our Abpromise guarantee. Should you still be experiencing difficulties, or if you have any further questions, please do not hesitate to let us know. I wish you the best of luck with your research. 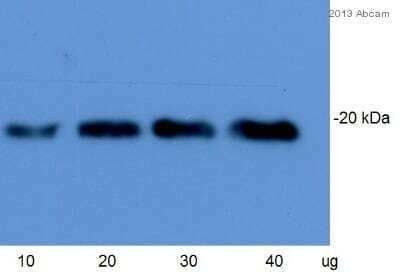 What is the WB protocol used for this antibody? Thank you for contacting Abcam regarding ab92721 and ab89594. I have received the following protocol information from the laboratory: Western Blotting Protocol Solutions and Reagents 2X Laemmli Sample Buffer: 62.5 mM Tris-HCl (pH 6.8), 25% glycerol, 2% SDS, 0.01% Bromophenol Blue, 710 mM beta-mercaptoethanol TBST (50 mM Tris, pH 7.6, 150 mM NaCl, 0.1% Tween-20) TBST is Tris Base Saline buffer with 0.1% Tween-20 5% bovine serum albumin (BSA): Use 25 g in 500 ml TBST Goat anti-rabbit HRP antibody - suggest ab6721 Goat anti-mouse-HRP - suggest ab6789 Chemiluminesence reagents; such as ECL materials and film or imaging system for detection Protocol Run SDS-PAGE using 10-60ug heart lysate and transfer to nitrocellulose membrane. Block nitrocellulose for 1 hour at room temperature or overnight at 4°C using 5% BSA Incubate nitrocellulose with appropriate dilutions of primary antibody in 5% BSA overnight at 4°C or for 2 hours at room temperature Wash nitrocellulose with three 5-min washes using TBST. Incubate nitrocellulose with goat anti-rabbit (or goat anti-mouse) HRP antibody, diluted to 1:500 to 100,000 in 5% BSA for 1-2 hours at room temperature. Wash nitrocellulose in 3 washes of TBST, then rinse in TBS prior to addition of chemiluminesence reagents. Remove excess chemiluminescence reagent and sandwich nitrocellulose blot in any type of transparent plastic wrap (plastic cling wrap, transparent sheet protector, etc.). Acquire image using darkroom development techniques. I hope this information is helpful. Please to not hesitate to contact us if you have any additional questions.